Nisha Ganatra on set. Photo courtesy of Nisha Ganatra. The Producer/Director of "Transparent" on Amazon and winner of two Golden Globe Awards chats about her journey from indie prodigy to becoming a TV director, and how she kept going through the lean years in between. Nisha Ganatra’s black and white 1996 short Junky Punky Girlz is about an outing where three friends—one white, one black and one Indian American—get their noses pierced. One of Ganatra’s first works, it helped launched her as an indie darling who went on to make the successful feature Chutney Popcorn in 1999, about a lesbian who agrees to be a surrogate for her older sister, all while dealing with the pressures of traditional Indian family values. As a bonafide 1990s desi grrl, Ganatra’s work was hugely important to me. I remember watching Junky Punky Girlz in the Multicultural Resource Center at Oberlin College, and getting that rare prickly excited feeling one gets when seeing a piece of art that truly reflects oneself. I didn’t catch Chutney Popcorn on the festival circuit, but I definitely rented it from Blockbuster Video—which was itself a declaration that indie Indian American stories were out there. 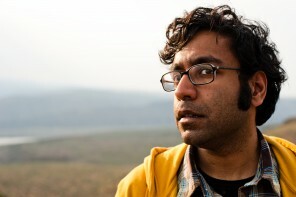 After making several more independent films (Cosmopolitan, funded by the Center for Asian American Media), Cake and Code Academy, part of ITVS’s Futurestates series) and spending many years trying to break into television, Ganatra recently re-emerged as a major talent as a co-producer on Jill Soloway’s award winning Transparent. You’ll also see her name as director on some of the most critically acclaimed shows on television today like The Mindy Project, Mr. Robot, Shameless, Hulu’s hilarious Married and Amazon’s Red Oaks. Plus this Fall, it was announced that Amy Poehler’s production company Paper Kite sold a pilot Ganatra wrote—entitled Pre-Madonna and based on her own adolescence—to NBC. Ganatra talked to me over the phone from her home in L.A., about her journey from indie prodigy to one of the hottest TV directors working today, and how she kept going through the lean years in between. Were you always interested in becoming a director? Looking back, I can see it was always an interest, but my parents were first generation immigrants from India. My mom came from a pretty small village in the North. My Dad was from Mumbai, but somehow the major film industry presence there didn’t really enter his consciousness. So, film was not a career option. It didn’t even exist for them in the realm of possibility. Looking back, I think I was always trying to make a video for that history presentation, so I did have an interest, but it took me so long to discover that this was even an option. When you graduated from high school, were you on a different path? How did you get into film? I stumbled into a theater class sometime in high school, but I was never going to get cast in the play, it was all white kids. I found a really amazing acting class at this community college. I think I wanted to be an actor because I thought that was the only way in. No one said, “Have you thought about directing?” Then I got cast in an AFI student film. I found myself looking at the crew, and luckily on one there was a female director and I thought, I want to do what she’s doing. I don’t want to be over here just playing this one part— I want to be over there, doing all the parts. Then I went to college at UCLA and was pre-law. I was sneaking into the film classes and not consciously realizing that was my passion. Somewhere in my last year of college, I realized I wanted to be a filmmaker and was like: Oh my god, it’s too late. But then I got a job as a PA, a lot of lowly industry jobs, and realized that I couldn’t really work my way up to the position of director on crew. I could work my way up to producer or Assistant Director, but I just couldn’t figure out where the directors were coming from. Then I found out that they were coming from this magical place called film school. (laughs) The great thing about building those communities was that it was like a built-in crew and I made a short film that got me into NYU, and that’s when I got very serious about becoming a filmmaker. Did your parents support your decision to go into film? The spin was I am going to go get my Masters or my PhD. If you have very traditional parents, you just tell them it’s graduate school. How was the experience of film school? It was amazing. NYU film school is a very learn-by-doing school. They put a camera in your hands, and tell you to go shoot. There was this incredible filmmaking faculty who insist that you make stellar work that doesn’t contribute to the dreck that is out there. They want you to be an auteur. I had never even heard that word before I got to NYU. 100 percent if I hadn’t gone to NYU I would have never made Chutney Popcorn. No one would have encouraged me to make that movie, at that time. Nisha Ganatra’s “Chutney Popcorn” debuted in 1999. With its focus on a queer Indian American girl in a relationship, it still feels ahead of its time now. Tell me about making the film. It started as a student film—that I developed with a classmate, but it quickly snowballed into a real feature. Junky Punky Girlz was doing really well in the festival circuit, so that was sort of springboard to Chutney Popcorn being taken more seriously as a first time director. Our casting director brought in Madhur Jaffrey and she was amazing. I knew her work from her Merchant Ivory films and sort of just her as a cultural icon, and she is so perfect and great and did this incredible interpretation of the character, and her real life daughter Sakina read and was great. At that time it was hard to find Indian actors, because no one’s parents let them go into acting, no one had training. (laughs) So finding Sakina was great because here was a second-generation Indian American actor who was actually trained, and your only other option was Sarita Choudhury, who was in everything. I really just wanted someone who was born in America, who didn’t have an Indian accent, who just got it, and was willing to play gay, and I was tired of Sarita representing all Indian Americans ever, but then I met her and she was so charming and amazing, and I [said], “Oh, that’s why she gets cast in everything, she’s amazing!” But then she couldn’t do it because she had a conflict, and I [said], “Sarita, who gets the part when you can’t do it?” She said, “There is no one, that’s why I get everything.” And then Sarita [said], “You should do it!” I was like, “No way, I am going to have my hands full with directing, but she said “You should do it, otherwise you are going to have to find a non-actor and train them.” So then I went on a quest to find a non-actor. I remember going to the New York India Day parade at one point just going up to people and saying, “Have you ever acted?” And then Jill Hennessy—who played the white girlfriend—was just like, “You should just play the part.” So we had a meeting with the crew. [I asked them] “Will you all quit if I do this?” They said, “No, let’s go, let’s shoot!” And they all helped me through it because they were all such better actors. I think only recently—over 15 years later—did I realize how amazing the experience was. I was thinking about it because Sakina Jaffrey was in town because she was doing a part on The Mindy Project and I was directing. I was remembering how when the film premiered in 1999 we were asked to come up for a Q&A, and Jill and I were walking to the front of the theater to do the Q&A, and I saw people standing up and I was like, “Oh gosh, everyone is leaving.” And you just hope that half the people stay for the Q&A, otherwise it’s just like, they really hated it. So out of the corner of my eye I see people standing to go, and I was really bummed, but trying to pep myself up, like, it’s okay, it’s your first showing, and I turn around and everyone was giving us a standing ovation but in my head they were all leaving. [In] those moments, you are just blown away. It took me so long to realize what a success that was, because my other classmates at NYU would have similar experiences at festivals, winning similar types of awards and then get a three picture deal in Hollywood. And I was getting these awards, it was financially successful, and I was [thinking]: Where is my three picture Hollywood deal? So you were waiting for the phone to ring? It was this crazy thing where you get all these meetings in Hollywood after your film does well at festivals. It was this strange round of meetings that was like, “This movie is great, but can you make a movie with white people?” And I was like: “Um, yeah!” And they would ask, “Are you only interested in telling lesbian stories?” And I would [say], “No, of course not.” It was this weird thing where I was being asked if I could translate Indian to American in my head and gay to straight in my film experience. There was this fear, can you fit into the mainstream? And I remember too even when we were meeting with distributors at the time. One distributor said, “Well, I don’t know why you cast Indian actors.” I [said,] “What do you mean” and he said, “Well, this is an American movie, you could have cast American actors and have it have a huge audience.” At the time, they had knew how to market these big period pieces like City of Joy or Kama Sutra, but they didn’t know how to market a movie about an American family who happens to be Indian, which was the whole point in making it. That was tough. But then I realized, if you can get an audience to cheer for an Indian American Lesbian to keep her sister’s biological baby and have her girlfriend help them, then you can handle whatever romantic comedy Hollywood is making this year. So, it took me awhile to say, okay yes, I can do this. So you continued making independent films. I was lucky because I was born in Canada so I had Canadian citizenship, and the Canadian film industry makes a lot of movies with female directors. So I got hired to direct a film in Canada. So I kind of sustained my filmmaking career by the magical fact I had Canadian citizenship. So then I got to build my credits and have this body of work so the American film industry would finally hire me. Then I did a film, Cosmopolitan, that was based on an Akhil Sharma short story that was published in The Atlantic—which was written by Sabrina Dhawan, the screenwriter of Monsoon Wedding. And lots more after that. But I was struggling in New York making indie films. Some of my other classmates from NYU had come out to LA and were writing. I called my friend Veena Sud, who had made all these great indie shorts, andshe told me about this minority women’s writing program. She said that she got to write everyday, and be creative. But I was kind of like: Hmmm, I’m seeing all the women I know go into writing and producing, and very few sticking with directing, so the feminist in me was like: I’ve got to stick with directing and make this happen. But then watching them all take off in this world of TV seemed pretty incredible and freeing, and I was like what am I doing sitting here in the world of indie films, when there is this world of TV happening on the other coast. I grew up watching Hollywood movies. I love Hollywood movies. I thought I should give it a go. I was also in a partnership, and my brother and my mom were out here, so I came out to L.A. to be in the industry and see what was happening around 2009. How did the move to L.A. go? That was a tough transition. For the first five years, I was like: Why did I ever leave New York? I was making a movie a year in New York. Why did I come here just to get doors slammed in my face? Veena went on to make The Killing, and suddenly it seemed like everyone from indie film was rising through the ranks of TV. So I came to L.A. and it was like, Oh, why don’t you shadow this person, or there might be a program to help you. And it was tough, because part of me was [thinking], Okay, I’ll shadow, I’ll do whatever, I just want a shot, but then as you’re shadowing you’re like, I can do this! When do I get a chance to do that? Nisha Ganatra is the Producer/Director of “Transparent” on Amazon (starring Jeffrey Tambor, Judith Light, Gaby Hoffman, Jay Duplass, Amy Landecker and Carrie Brownstein) and is a winner of two Golden Globe Awards. I think all kids of immigrants get this scrappiness about them. Like, I’ll do whatever it takes, just tell me what to do. Or, I can’t figure out what to do, but I’m going to keep trying these different ways, but nothing was breaking through. So, I was kind of like, Huh, maybe that’s it. I’ve kind of gone as far as I can go, and maybe I was supposed to be a doctor or a lawyer, and I’ve gotten this far by sheer tenacity, but maybe it wasn’t meant to be. And I literally went and got my Vedic astrology read. You know how when you’re born Indian parents get your whole horoscope done, like the story of your life. So my mom had these scrolls and she never let me look at them, but I was like: Mom, I’m really at a crisis point, I just really need to know if I should like go back to school and switch careers. So, she gave it to me, and was like, just read up to where you are now. So I found this Vedic astrologer in L.A. and brought him this chart and was like, can you just let me know if I’ve made horrible decisions. And so he read my horoscope, and I didn’t tell him anything. And it is crazy, this thing was written the day I was born by this village astrologer, who I had never met. And everything in it was so accurate. And then the astrologer was like: “Oh my gosh, I’m so sorry. There is this big planet that’s in your way and nothing you try is going to go your way until like 2013.” This was in 2011. I was like what? What are you talking about? Things are going my way, I am making a living as a filmmaker. It is what I wanted. And he said, “No there is nothing in the universe helping you do that. That was out of your sheer will. Nothing was helping you. The good news is that planet will move and everything will come much easier.” I was like: “Okay!” I asked him, I just need to know if I should go back to school and find another profession, and he was like: I don’t know, all it says here is storytelling. And I was like,, I am a writer. And I started getting back to writing, and did more shadowing. And then literally, at the end of 2012, got a job directing a movie. And was like: THANK GOD. And then the producer of that hired me for another film. And then because I had been writing, I did another short, Code Academy. And then right when I was finishing that, Jamie called me and said that there was this show Transparent and they don’t want TV directors, they want an indie filmmaker. “I think you should go meet with Jill Solloway, I think you guys would be a good match.” And so, that was kind of amazing, and obviously that changed everything. I was a huge fan of Jill’s writing, especially Six Feet Under. She gave me the first four scripts of Transparent, and we had a really good conversation and she said, you know, I’m just looking for someone to co-direct the whole season together. And it was great. It was my first TV directing experience and it was doing the entire season. That is literally one of the most amazing stories I have ever heard. It’s this whole journey. If I had a billion TV credits I would have never gotten Transparent. It’s like everything does work out in the end, it’s just really nerve wracking while you’re waiting for it all to get figured out. After Transparent was so critically acclaimed and won a Golden Globe, then it was easier, though Mindy Project hired me before any of that. Now that I’m inside of it, I do understand that in network TV there is so much riding on each episode that it is hard to take a risk, but Mindy really did. Jill, too. She was like: “You’re a filmmaker, and a woman, you obviously know how to do this, let’s do it.” Then I had to just say yes to every opportunity that came along and I went a little overboard. 2015 was a pretty amazing year. I think there was just two weeks out of the year when I wasn’t on a set directing. Then you are practicing your craft every single day and what happens when you practice your craft every single day is that you get better at it because you are doing it. And it is something I think a lot of men who get to do this everyday take for granted. It is a real privilege to be able to practice the craft of directing. Unlike writing, you can’t just sit in your room and practice every day. With directing, you need a set. It has been a stunning year of working on really amazing shows, Mindy Project, Married and Red Oaks for Amazon. Shameless on Showtime. That was something I never experienced. When the trade announcement came out that Amy Poehler had sold my pilot to NBC, I sent her an email and said, “It’s been 15 years of that’s too Indian, and that’s too gay, and this is an amazing moment and thank you.” And she called me and was like, “Aw, that made me cry.” I was like, it made me cry. I was just going to ask you if you feel like things have changed since you started in this industry, but I feel like your story is the answer. I’m an optimist. I have to be in order to survive. I mean, the whole landscape had changed since I made Chutney Popcorn. Fresh off the Boat is a big hit, Black-ish is a big hit, Empire was a big hit. Suddenly, people are like: you have something with an Indian girl lead? Give it to us! Things aren’t changing fast enough, but things are changing. The goal is to have my own show. Hopefully to work with Amy Poehler for the rest of my life. (laughs) I’m also working on a new indie film. I think it will be fun to make that with all the knowledge I have now. Just the act of doing it makes you better, so it’s fun to keep challenging yourself that way. Neelanjana Banerjee is the Managing Editor of Kaya Press.